We are huge fans of reading. We believe that reading is a restful and growth engaging exercise that you can see huge breakthrough in. If you are looking to grow in Faith and Love in your walk these books will help you grow in these two key areas of Christian faith. This true story of a husband and wife missionary team in Mozambique will inspire you to love others even more. Rolland and Heidi Baker served for 27 years in Mozambique, one of the poorest and unhealthiest countries on earth. In their ministry, the Bakers saw God provide healing for thousands of sick people, food for throngs of hungry seekers, and renewed hearts in many who sought freedom from desperate struggles. Learn about the beatitudes through these powerful, true stories of how God’s kingdom works on earth. 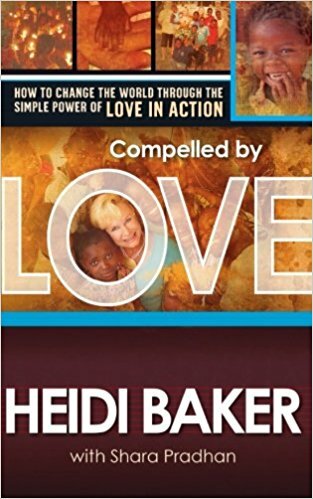 Heidi Baker uses Jesus’ teachings to show how Christians should love others and minister to their needs. God’s love transformed the people in Mozambique, and His love will transform you and inspire you to love others more selflessly. Rolland and Heidi Baker founded Iris Ministries in 1980. Their missionary work has taken place in China, Indonesia and Mozambique. Their ministry now helps over 5,000 churches in Mozambique and other countries. Heidi is affectionately called “Mama Heidi” by the many children who have been rescued from poverty and disease through Iris Ministries. This book is one of the most popular Christian books ever published, with over 11 million copies sold worldwide and a New York Times bestseller for eight years in a row. It’s a highly practical resource for learning to show love in new ways. Learn how to experience deeper levels of intimacy with your partner through the practical steps outlined in this book. Whether you have an unhappy marriage, or you have a marriage that you want to take to the next level, The 5 Love Languages can help you. Take a personal assessment to understand which of the five love languages you respond to most and learn how to ask your partner to love you in ways that you feel best. By engaging with your spouse in the top five love languages, your spouse will feel greater love from you. Dr. Gary Chapman has been a marriage and family counselor for over 30 years. He has seen many relationship conflicts resolve by the power of understanding how the five love languages work. By applying the knowledge in this book, you’ll be more satisfied in your relationships. You’ll experience the joy of loving your spouse in the way that he or she understands. You will also be blessed by opening the lines of communication in your marriage to tell your spouse how you need to receive love. You will enjoy Dr. Chapman’s down-to-earth, friendly tone and his real-life examples from his practice. Dr. Gary Chapman is a well-known author, speaker and counselor who regularly appears on radio broadcasts and seminars. He is the director of Marriage and Family Life Consultants, Inc. and lives in North Carolina with his wife Karolyn. Do you want to grow your knowledge about faith and healing at the same time? This book will show you how to do just that. Using biblical examples of healing miracles, authors Bill Johnson and Randy Clark introduce you to the concepts of ministering healing through prayer. They take great care to follow the scriptures closely to teach you the truth about healing, and how it applies to the church today. Packed with stories of inspiration, this book offers many practical tips and guidance for starting your own prayer ministry. This book promises to help you receive knowledge from God’s Word, build your faith, understand your role in healing, and use a five-step prayer model in a healing ministry. Everyone who believes can play a role in the healing work of God’s Kingdom on earth. Bill Johnson is the senior pastor of a thriving church in Redding, California. He and his wife Beni work with many other area churches to inspire revival in their community. Bill is also the best-selling author of When Heaven Invades Earth. Randy Clark is an international speaker and founder of Global Awakening. He speaks and teaches at many different churches across the world, promoting the missions of humanitarian aid, healing and leadership training. He and his wife DeAnne live in Pennsylvania. God’s Kingdom is pouring light into our dark culture. The Holy Spirit will release greater glory as the last days approach before Jesus’ second coming. This book will prepare you for that coming glory. It will teach you how to have a holy fear and respect of God, seek God’s presence, gain deeper fellowship with the Holy Spirit, and watch for signs that the glory is approaching. John and Carol Arnott have served in revival ministry since the early 1990’s. Their work in the Toronto area touched thousands of people with fresh knowledge of the Holy Spirit’s power. They are international speakers with their ministry known as Catch The Fire. They have witnessed God’s love and power transform the lives of millions across the globe.